A banner strung across the top of the stadium seems to go on forever, imprinted with each of the 21 years in which the Hoover Vikings won a Federal League football championship. It has been a while, though. The last league title year exhibited is from 2008 … 10 long years. The 2018 Vikings may not get there. But with Friday night’s 42-13 conquest of Green as the latest evidence, they are getting somewhere. 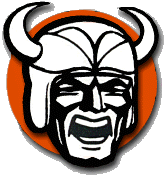 Hoover’s last home game (road trips to Columbus Bishop Hartley and Jackson remain) left the Vikings at 6-2 overall, right in the hunt for the Division II playoffs, and 4-1 in the league they joined in 1968. They clinched their first winning season since 2012. Junior running back Adam Griguolo ground 142 yards and three touchdowns out of inside carries, most of them dive plays. Sophomore quarterback Connor Ashby went 11-of-13 passing for 132 yards and two TDs. Hoover’s defense allowed 166 yards while the offense was racking up 366. “They’re big and they’re aggressive,” Green head coach Jon Wallace said. “That big offensive line moves you around. The quarterback’s mobile. The running back’s really good. They have tall wide receivers. It is the time of autumn when the sun is gone before kickoff. The Vikings’ orange helmets glistened like merry jack-o-lanterns in the Friday night lights. Green, wearing black numbers tinged in orange, stepped into a nightmare. The Bulldogs’ first play was a false start. The fourth was a partially blocked punt. Hoover opened with three straight dives by Griguolo and kept going to that well. The dives set up the passing game. Six-foot-5 wideout Trent Graham ran a deep post from the Green 40, measured Ashby’s bomb, and lunged to snag the ball in the end zone. It was 7-0 with four minutes gone. Then Green fumbled at the 13 (AJ Vega recovered) during the kickoff return. Griguolo, closing in on 1,000 rushing yards, scored from the 2. It was 14-0. Then the Bulldogs fumbled a short kickoff, giving Hoover the ball right back at the Green 36. Griguolo scored from the 1. It was 21-0 with 7 1/2 minutes gone. The Bulldogs’ season is gone (they are 1-7), but they displayed some grit. After a Hoover field goal try doinked off an upright, Green mixed up runs, got a fourth-and-10 conversion catch from Jacob Gonzalez, and jumped on the board with Federal League rushing leader Porter Flinn‘s 11-yard TD run. It was 21-7 with four minutes left in the half. Green needed a stop. Hoover delivered a drive. Ashby passed and scrambled the Vikings to a first and goal from the 1. Connor Mayle ran for the touchdown that made it 28-7 with 21 seconds left in the half. Green’s dilemma included an injury to Flinn, who didn’t play in the second half. The second half opened with a spit of rain and a splash of Griguolo, whose nine runs covered the entirety of a 55-yard dive capped by his two-yard TD. It was 35-7. With Griguolo well past 100 yards, Hoover began feeding sophomore Ryan Prusinowski, then went back to Griguolo, missed a field goal, recovered a fumble, and got a 19-yard TD pass to Mike Robinson on the final snap of the third quarter. They played the fourth quarter, but already, a banner day for the home team had carried the night.